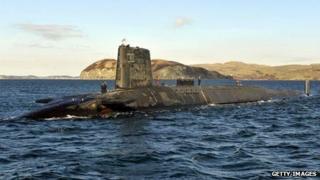 Royal Navy nuclear submarines have been temporarily banned from two Scots lochs after failing training assessments. Problems with safety procedures were identified during simulated submarine accident exercises in March and April. The Defence Nuclear Safety Regulator has banned submarines from Loch Goil, near Faslane, and Loch Ewe in Wester Ross, while the issues are addressed. The Ministry of Defence said there was no risk during the recent exercises and the subs continued to operate safely. An MoD spokesman said: "The MoD takes its nuclear safety responsibilities seriously and conducts regular training to maintain high standards. "We are taking steps to address the issues raised by regulators following recent exercises but there is no risk of harm to the public or to the environment. "The Royal Navy continues to operate submarines safely out of Her Majesty's Naval Base Clyde."